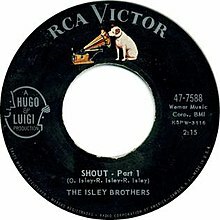 "Shout" is a popular American song, originally recorded by the Isley Brothers. Released in 1959, it was written by the brothers themselves as a call and response answer to Jackie Wilson's "Lonely Teardrops", which they would occasionally cover in live performances. While the song did not reach higher than #47 on the Billboard Hot 100, it became the brothers' first gold single on the basis of its longevity, and it became a much-covered tune, with many U.S. and international artists recording the song. One month after the initial release, Johnny O'Keefe covered it in his Australian TV show Six O'Clock Rock and released it as a single, reaching #2 in Australia. His 1964 re-recording was only a minor hit at #49. Joey Dee and the Starliters reached #6 with their recording of the song in 1962 (The Starlighters also worked the call-and-response portion of the song into its even bigger hit, "Peppermint Twist"), while the Isley Brothers' version re-charted that same year at #94. Scottish pop singer Lulu had a #7 UK hit with the song in 1964 (attributed to Lulu and the Luvvers), and a #8 UK hit with a re-recorded version in 1986. The Shangri-Las included a version of the song in their debut LP Leader of the Pack in 1965 as did the Kingsmen on their Volume 3 album in 1965 and 15 Great Hits album in 1966. Tommy James and the Shondells recorded a version of the song on their 1967 album, I Think We're Alone Now. Question Mark & the Mysterians recorded a version of the song on their 1967 album, Action. The Ronettes frequently covered the song in live performances as well, including their appearance in The Big TNT Show. The Trammps released a version of the song in 1975. The song, as performed by Otis Day and the Knights, was also prominently featured in the 1978 fraternity house film National Lampoon's Animal House. Alvin and the Chipmunks covered the song for their 1996 album Club Chipmunk: The Dance Mixes with Simon providing the lead vocals. The Beatles included a live version of the song on their 1996 rarities compilation, Anthology 1. American rock group Bon Jovi has covered this song live preceded by "Bad Medicine". American punk rock band Green Day performed the song on their 2005 live album Bullet in a Bible after "King for a Day". Green Day has also regularly performed the song during their live shows since at least 2005, always after "King for a Day". Also Bruce Springsteen often performs this song live in a medley with "Twist and Shout". Blaine Anderson (Darren Criss) and Brittany Pierce (Heather Morris) performed the song in the 2013 Glee episode "Girls (and Boys) On Film". Robbie Williams performed the song as part of a "Call & Response Medley" on his Swings Both Ways tour in 2014, along with "Reet Petite" and "Hit the Road Jack". The song was inducted to the Grammy Hall of Fame in 1999. It ranked #118 on Rolling Stone's list of "The 500 Greatest Songs of All Time". Johnny O'Keefe 1959 (One month after the original release). The 1959 original by the Isley Brothers appeared in the 1967 film Thoroughly Modern Millie, the 1982 comedy film Diner, and the Cheers fourth season episode "Suspicion". The Isley Brothers' version was also featured in "Night Out", a 1990 third-season episode of The Wonder Years, in which Kevin Arnold and Winnie Cooper are invited to a notorious make-out party. With time, "Shout" has gradually woven itself more into many iconic American media, such as a dance song in which people progressively crouch down to the dance floor as the song gets quieter. For example, at the end of the third quarter of an Oregon Ducks game at Autzen Stadium, in recognition of National Lampoon's Animal House being filmed at the University of Oregon in 1977-78, the crowd traditionally dances to the song. Since 1987, the National Football League (NFL)'s Buffalo Bills have used a one-minute customized cover version of the song by Scott Kemper as their fight song. The Indiana Pacers also briefly used Kemper's version of "Shout." ^ "Johnny O'Keefe with the Rajahs - Shout (Parts 1 & 2)". Where Did They Get That Song?. PopArchives.com.au. Retrieved October 17, 2011. ^ "Lulu and the Luvers: Shout". 45cat.com. Retrieved October 17, 2011. ^ a b "UK Top 40 Hit Database". EveryHit.com. Archived from the original on March 19, 2008. Retrieved October 17, 2011. Enter Lulu for Artist and Shout for Title and click Search. ^ "The Shangri-Las Albums". TheShangri-Las.com. Leader of the Pack. Archived from the original on 2011-10-17. Retrieved October 17, 2011. ^ Tommy James and the Shondells, I Think We're Alone Now Retrieved August 17, 2012. ^ "Green Day - Bullet In A Bible Album Tracklist". Sing365.com. 2005-11-15. Archived from the original on 2007-02-09. Retrieved 2014-06-06. ^ "The Beatles - Anthology 1". Discogs. Retrieved 21 March 2018. ^ "Shout by Panic! at the Disco Concert Statistics | setlist.fm". www.setlist.fm. Retrieved 2018-06-09. ^ "Cover versions of Shout by The Isley Brothers - SecondHandSongs". secondhandsongs.com. Retrieved 21 March 2018. ^ "The Wonder Years - Night Out (TV Episode 1990)". IMDb.com, Inc. Retrieved 12 August 2018. ^ "The Wonder Years - Night Out (TV Episode 1990) - Soundtracks". IMDb.com, Inc. Retrieved 12 August 2018. ^ Buffalo Bills [@buffalobills] (November 8, 2017). "Hey-ayyyyyyy-ayyyyyyyy-ayy! Hey-ayyyyyyy-ayyyyyyyy-ayy! Hey-ayyyyyyy-ayyyyyyyy-ayy! Hey-ayyyyyyy-ayyyyyyyy-ayy! Let's go Buffalo! Let's go Buffalo! Let's go Buffalo! Let's go Buffalo! The Bills make me wanna SHOUT! Thanks for letting us sing our song in 280, @Twitter. #GoBills" (Tweet) – via Twitter. ^ Lipshutz, Jason (September 4, 2014). "The 10 Best NFL Fight Songs". Billboard. Retrieved January 1, 2018. "Say I Am (What I Am)"
Songs written by O'Kelly Isley Jr.